A video from the Islamic State group purports to show militants destroying ancient artifacts in Iraq’s Mosul Museum. It was released Feb. 26, 2015. The cultural heritage of Syria and Iraq is under siege, suffering collateral damage from years of war and deliberate assaults from the Islamic State and other religious extremists. Preserving what’s left has become the mission of countless individuals in conflict areas and their supporters in the international community. The players range from individuals secretly photographing precious relics, and sometimes hiding them away, to the United States and other governments clamping down on the trade of looted antiquities. "A lot of brave men and women in Syria and Iraq are doing everything they can at the local level to try to save material culture. That isn’t enough," said Michael Danti, a Boston University assistant professor who is directing two archeology projects in Iraq and advising the U.S. State Department on preservation. One project is in partnership with Mosul University, in Iraq’s second-largest city. A video released Thursday on Islamic State social media accounts purportedly shows men rampaging through the Mosul Museum, toppling ancient statues and attacking them with sledgehammers and drills. The museum contained artworks primarily from the Assyrian Empire, dating to roughly 700 B.C., and from the ancient trading city of Hatra. 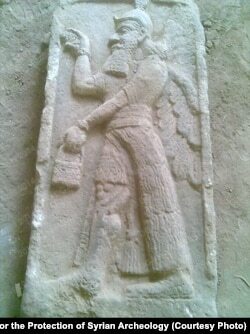 Its holdings included "some of the best examples of Assyrian sculpture remaining in Iraq," Danti said. While more choice pieces are held by the British Museum, the Louvre and other institutions, he added, "the loss is enormous." The extremist Islamic State group and al-Qaida-linked Nusra Front practice a narrow brand of Sunni Islam that justifies purging what adherents regard as temptations for idolatry. But the extremists’ contempt for non-Muslim culture also gives way to desire for cash. Close observers say they traffic in looted items, or extort protection money, to help finance their operations. Others, too, have taken advantage of the chaos in conflict zones. The volume of illicit trade in items from Syria alone has surpassed $100 million a year, The Wall Street Journal recently reported, attributing the estimate to U.S. officials. A loose affiliation of equally determined preservationists and supporters is trying to counter the looting and decimation, with help from partners including Americans or people with U.S. ties. The ground troops are the contemporary equivalent of World War II "monuments men," an undercover team of Allied curators and historians sent to rescue prized artworks from Nazi looters and censors. But, unlike protagonists in the 2014 Hollywood film, these are homegrown preservationists and volunteers risking their lives to safeguard precious antiquities and sites – or at least provide records of them. Amr Al-Azm, who once led conservation labs for the Syrian General Department of Antiquities, teaches in the United States but tries to aid preservation efforts in his homeland. "This is not a singular network of people who are under one leadership, all working together and organized. Most of it [the work] is done on an ad hoc, individual basis," said Amr Al-Azm, who for five years directed conservation laboratories for the Syrian General Department of Antiquities and Museums. 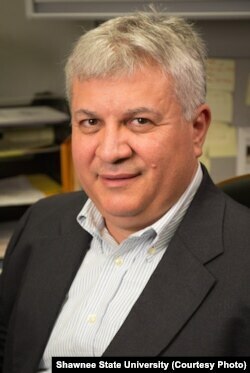 Now Al-Azm teaches at Shawnee State University in the American state of Ohio and chairs the Syrian Interim Government’s Heritage Task Force, trying to help some of those "little disparate groups" in his homeland. The cultural brigades in both countries – mostly anonymous Iraqis and Syrians – take grave risks to document, protect and preserve historical treasures. "We’ve seen how violent jihadi Salafist groups can be," said Danti, the Boston University archeologist, hinting at recent beheading and immolation deaths. "These individuals would be at high risk for kidnapping and atrocities." Some assistance comes from Safeguarding the Heritage of Syria Initiative. The SHOSI Project is an umbrella group of scholars, heritage specialists and other volunteers, Al-Azm said, that strives to "bring resources" and "see what needs the guys on the ground have." Al-Azm and others working in cultural heritage plan a training session on emergency preservation strategies for the ground troops, perhaps as early as this spring. An earlier one last summer, at an undisclosed location outside Syria, brought together about 20 heritage professionals from several of the country’s provinces for three days of strategizing. "We’re trying to help our colleagues who are working in opposition-controlled areas to give them training and tools to protect and stabilize what they have left," said Corine Wegener, a cultural heritage preservation officer for the Smithsonian Institution in Washington, D.C. She and Al-Azm were among the trainers. Facilitators – who also came from the University of Pennsylvania’s Penn Cultural Heritage Center, and the Universite of Paris, the U.S. Institute of Peace – provided hand tools plus cameras for documentation, Wegener said. "We talked about emergency packing and crating – protecting archeological sites," she added. Some participants had salvaged collections of valuable pots and other artifacts, sheltering them in private homes. Participants learned smaller objects "should be wrapped in paper, packed and put in boxes" for easier transport to a safe facility, Wegener said. "It also helps to keep collections together." Later, facilitators arranged funding so the locals "could buy sandbags for stabilizing immovable objects" and shore up walls or protect fragile elements, she added. A target of concern has been Syria’s Ma’arra Museum, prized for its collection of Roman and Byzantine mosaics. Al-Azm said it had sustained damage from direct attacks in 2012 and later from indirect barrel bombing by Syrian government aircraft. He said local archeologists and curators have been working to protect the building and its contents from further damage. Committed preservationists include some working within the government of Syrian President Bashar al-Assad, said Al-Azm, a board member of the opposition Day After Project. The civil society group plans for a democratic transition. Those preservationists must cope with the constraints of international embargoes, he added. The U.S. Treasury imposed sanctions against doing business with Syria’s government, accusing it of terrorism and committing human rights violations. "So they need materials or equipment [but] they can’t buy it," Al-Azm said of his former colleagues. The push to document cultural treasures and their loss builds on earlier efforts. Syria began cataloguing its museum collections upon learning what happened to Iraqi antiquities after American-led troops seized control of Bagdad in early 2003. Thieves stripped its unguarded National Museum within days. Al-Azm, then working in Damascus, said he and his museum-division colleagues "became acutely aware of how ill-prepared" they would be to protect artifacts amid chaos and a power vacuum. But only a fraction of Syria’s museum holdings were documented before civil war broke out in 2011, he said. As part of the SHOSI Project, the University of Pennsylvania’s Penn Cultural Heritage Center is creating a database recording baselines and subsequent damage of prized sites in Syria. UNESCO has designated six World Heritage sites there, with others being considered. Five of the designated sites – all but the ancient city of Damascus – "exhibit significant damage," the American Association for the Advancement of Science determined through high-resolution satellite imagery. Monitoring is done by the association’s Geospatial Technologies and Human Rights Project, working with SHOSI. The geospacial group also has found evidence of devastating looting and other destruction at four of the six tentative World Heritage sites, including Raqqa, the Islamic State group’s de facto capital. On Friday, the head of the United Nations’ cultural arm decried the actions shown in the Islamic State video as "cultural cleansing." UNESCO’s director-general, Irina Bokova, told reporters that a "global coalition against the illicit traffic in cultural goods" was being formed, The Associated Press reported. UNESCO chief Irina Bokova denounces Islamic State militants' purported attacks on Iraqi antiquities at a news conference in Paris, Feb. 27, 2015. 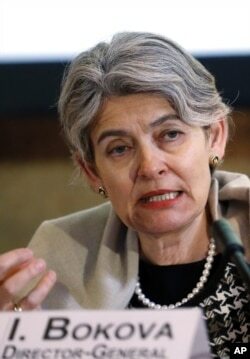 A day earlier, Bokova pressed for a U.N. Security Council meeting on the destruction in Mosul. She said the attacks violate a council resolution, passed February 12, that condemns cultural heritage destruction and established measures to counter the trafficking of illicit Iraqi and Syrian artifacts. Pending U.S. congressional legislation also could help curb some of the Near East’s cultural losses, said Danti, the American archeologist. A House bill proposed by Representatives Eliot Engel and Chris Smith aims to preserve cultural artifacts, crack down on trafficking and cut off their illicit sale as a funding source for terrorists including the Islamic State. The State Department, meanwhile, is encouraging other governments, "particularly those that are involved with the transiting or marketing" of looted items, "to counter the trafficking," said Susan Pittman, spokeswoman for its Bureau of Educational and Cultural Affairs. "Our goal is to preserve the integrity of these sites" and the cultures and civilizations that are part of the region’s identity, she said. The department has worked with the International Council of Museums on an emergency "red list" of Syrian cultural items especially vulnerable to looting, such as jewelry, coins and statuettes, Pittman added. Customs officials, art dealers, museums and collectors can consult it for suspicious objects. Tighter border controls also would help, both Danti and Al-Azm said. Syria’s northern border with Turkey especially needs reinforcement, Danti said, citing satellite images. He recommended closing it in Syrian towns such as Tel Abyad, "where there is a steady flow of people and arms and almost certainly antiquities." Syrian cultural minister Issam Khalil, in an interview with Reuters last weekend, asked the international community to pressure Turkey to tighten the countries’ shared border and thus stanch the smuggling. The next day, February 22, hundreds of Turkish troops made a raid into Syria to recover a 13th-century Ottoman crypt and evacuate roughly 40 troops who’d been trapped there for months while guarding it. The incident heightened tensions between the countries. Turkey’s government has denied Syrian charges that it condones jihadist activities and said it can’t patrol the 910-kilometer border more closely. Khalil’s pointing fingers at Turkey is disingenuous, Al-Azm said. "He should talk about the one border his regime controls" – with Lebanon, which the opposition activist called a "well-known destination" for smuggling looted materials. Preserving ancient cultural artifacts is vital to the future of both Iraq and Syria, experts interviewed for this story agreed. "One day, the fighting will stop and Syrians will have to go back ... to the business of putting their country back together again," Al-Azm said. "Cultural heritage represents their common shared experience. It's going to be absolutely critical to provide a bridge across this divide."